ColorPave™ HD Clear Coat is a 100% acrylic, clear drying emulsion specifically formulated as a protective top coat for ColorPave™ HD color coatings. It provides additional protection against ultra-violet rays, moisture, oil, gas, and chemical attack. ColorPave™ HD Clear Coat is a 100% acrylic, clear drying emulsion specifically formulated as a protective top coat for ColorPave™ HD color coatings. It provides additional protection against ultra violet rays, moisture, oil, gas, and chemical attack. ColorPave™ HD Clear Coat helps extend the service life of ColorPave™ HD color coatings. ColorPave™ HD Clear Coat is a ready to use product. Do not dilute. Stir material before applying. ColorPave™ HD Clear Coat shall be applied by spray, brush, or roller. 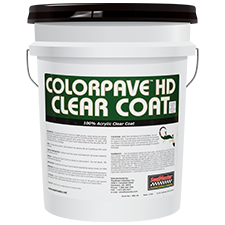 Apply ColorPave™ HD Clear Coat at a rate of .04 gallon per square yard (approximately 200 square feet per gallon) in a single coat application.